The Guidelines for a Secure Family Environment are a tool directed at parents, professionals working directly with children and policy makers in the area of child protection. They document the main areas of parental care, which are required to make a child safe, secure and happy in the family environment. The Guidelines are the result of action research involving more than 300 people, who were engaged in the entire process of creating the tool, including representatives of the professional community from all over the country. They are based on positive examples shared in conversations among children, families and experts. They also demonstrate a new way of thinking, which pays attention to “the voice” of the children. The Guidelines are grouped in seven subject matter areas: safety, feelings, stimulation, rules, identity, family relations and daily care. These areas are represented by a seven-leaf clover. There are certain parameters in every area, which help parents and professionals to systematize all the elements that are needed to ensure the holistic development of children. The Guidelines come with a manual for professionals, which sets out how they can be used to work with families to improve parental capacity. 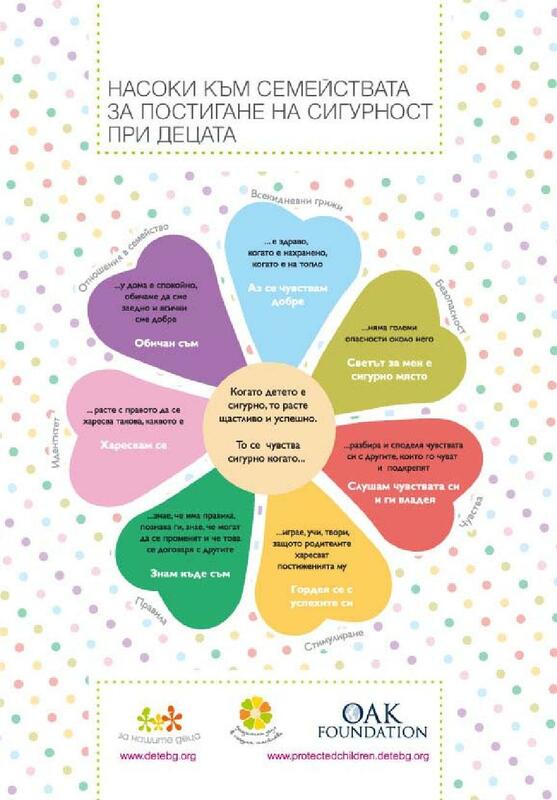 The manual has been piloted with social workers and specialists in Child Protection Departments and social services in Bulgaria, and has been found to work really well in these contexts. Besides the manual, there is also a booklet for working with children, which helps parents in understanding what makes their children happy and secure.